Tidy Mart a well knows International Trading company which deals with Hematite Iron Ore-Fe2O3. We have wide network and good business relationships with, mine owners, traders, exporters and logistic company. We are team of people who have expertise in this Hematite Iron Ore field. 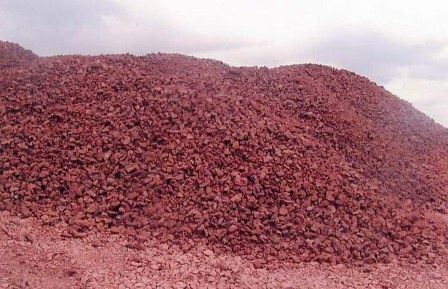 We have tie up many mine owners to procure different grades of Hematite Iron Ore-Fe2O3, it various Fe45% to Fe65%. Hematite ores are harder than magnetite ores and therefore requires considerably more energy to crush and grind if beneficiation is required. Tidy Mart's extensive relationship helps our clients to work with acknowledged expertise in this Industry. Through our wide network, certainly we are fulfilling our client's requirements interms of Timely Delivery along with Quantity and Quality. Tidy Mart consortium will support for the entire activity in this Hematite Iron Ore trade, and support the buyers to meet out their Hematite Iron Ore-Fe2O3 requirements. China is the main importer of iron ore and in fact India's exports (of iron ore) to China alone are far in excess of its domestic consumption. The payment shall be 100% Irrevocable Non-Transferable letter of credit payment at sight against loading port Documents. Seller 2% operational PB opens non-operational LC. The Quantity and Quality certificate will be by SGS/CCIC or equivalent, at seller`s cost at loading port. 1) Seller's signed Provisional commercial invoice in one original four copies indicating name, specification, quantity and value of commodity shipped, name of carrying vessel, contract number, L/C number, and B/L number for drawing 100% of invoice amount. 2) Full set of 3/3 original "Clean on board" charter party B/L showing capacity of Issuing party and made out to order, blank endorsed marked "Freight payable as per charter party " notifying the party as stipulated on the L/C. 3) Certificate of Analysis at the Loading Port in one original and three copies issued by SGS/CCIC must showing "Issued at the loading Port". 4) Certificate of Weight at the Loading Port in one original and three copies issued by SGS/CCIC must showing "Issued at the loading Port". 5) Certificate of Origin in one original and three copies issued by (Original country) Ian relevant commerce organ. 6) Beneficiary's certified copy of fax sent to the Buyer within 2 days after shipment advising name of vessel, Bill of lading date, and contract number, name of commodity L/C number, quantity/weight, and invoice value. 7) Beneficiary's certificate certifying one set of non-negotiable shipping documents are sent to the Buyer by fax within 10 working days after shipment. Tidy Mart providing some sample FCO, in the following link for Buyer's convince. Buyers are requested to download the FCO from the link and can be used strictly for sample purpose and for clarification. Further if you have any quires related to Hematite Iron Ore imports, kindly mail us with your entire requirements in details. We will discuss with our team members to fulfill your Hematite-Fe2O3 Iron Ore requirements, and we are happy to assist you.